It was a dreary and rainy Halloween. But I really didn't mind. I had the oven on with this gratin in it. Dinner was pork chops, tomato-apple chutney and this crispy topped goodness. There was apple cider (will it be hot, spiced or with rum? see below to find out what we did! *) and a lot of candy. This year we trick-or-treated in our own home. My son, who is now in kindergarten, was given the choice to go out to our friend's house to trick or treat like we've done for the past few years, or stay home. He picked home, and home it was. It's funny how it takes you a while to really know who your kids is. I mean, you've always known, of course, but at this age they can talk and make choices, and they might even know themselves a bit more. I always find that my son knows himself so much better than I do. So I try to listen. After a few years of taking him out for trick or treating (and I'm not hugely into Halloween, but I thought that's just what you do, right?) he can finally tell me, "No, I'd rather stay home." So, we stayed in: put on the Monster Mash, carved another pumpkin, lit some candles, and yes, ate some candy! I got a huge bowl of all different kinds of candies, and we had our own trick or treating fun knocking on the porch door and then going to the front door for more. We had so much fun!! This gratin was real winter time fare. So hearty! I used this recipe from the NY Times as a guideline. While I was searching for a recipe, I found this one that looks promising, as well, which had cornmeal and dijon mustard in it. Saute onion and garlic in olive oil. Add cabbage and slowly wilt, adding the water as needed so there's just wilting and no browning. In a separate bowl, mix the eggs with the rice, buttermilk, parsely and 1/2 cup of the gruyere. When the cabbage is looking good (to me this means a mix of really wilt, almost yellow-y cabbage, and some still crisp, bright chartreuse) add it to the egg mixture and toss gently. Put the mix in your prepared pan, and sprinkle with the rest of the gruyere, a liberal amount of parmesan, and the nutritional yeast flakes. Bake for about 40 to 50 minutes, until browned and bubbly. NOTE: This makes a large amount of gratin. It's great for a group, but it also works well in leftovers. We had it the next night fried up in the cast iron skillet, for a crispy hash that was served with some bratwurst and mustard. Then I used to riff on this recipe for Italian Cabbage Bread Soup. Instead of the veg and cheese, I layered this gratin on the bread. It came out really very good! *Note: We ended up having hot toddies. They were SO good. Heat two cups of apple cider with a cinnamon stick (a little orange zest would be good, but I forgot it!) When it's just simmering, turn off the heat and add 3 ounces of applejack and one ounce of the King's Ginger. Throw in some crystallized ginger, pour in a Liberty mason jar mug and cheers! That all sounds fantastic! I think it's adorable your son wants to stay home. Is he a Cancer? And what is the King's Ginger? He's a Libra. I'm not sure of his rising and moon signs, though, I still haven't gotten a chart done for him. 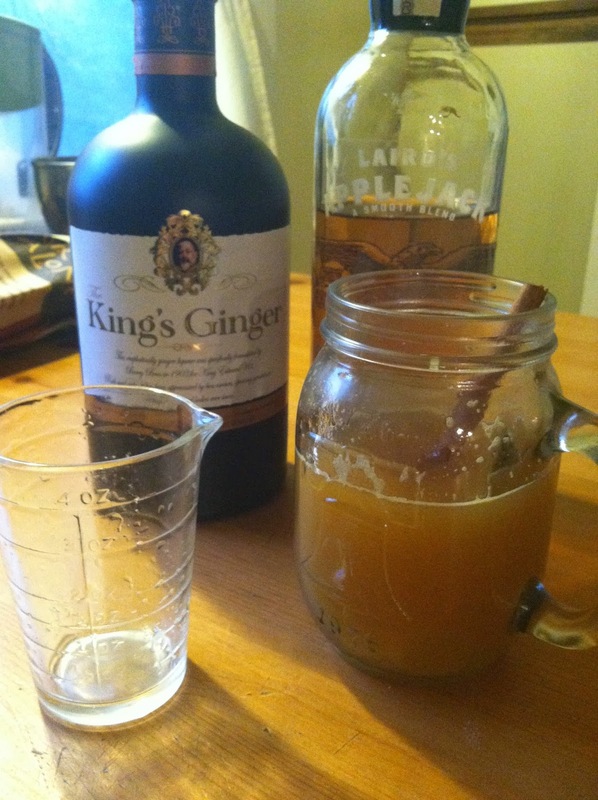 The King's Ginger is a fabulous ginger liqueur that makes pretty much anything you pour it into delicious!